Camping near to London at it’s best! The Secret Campsite Beech Estate is in a secret forest location. We provide camping with forest tent pitches and glamping bell tents. It’s a perfect for campers looking for a location offering camping near to London, Brighton, Eastbourne, Hastings, Bexhill and the South Coast. Located in an Area of Outstanding Natural Beauty (AONB), as part of the private 2000-acre Beech Estate, the campsite is tucked away in a beautiful 600-acre woodland. Beech Estate is hidden in East Sussex between Netherfield and Ashburnham, near the historic town of Battle. Once you have booked via our online booking system, we email you with a link which has detailed instructions to locate the campsite and our car park. If you input into Google Maps ‘The Secret Campsite Beech Estate’ this will take you directly to our entrance on the B2096. Here’s the Google Maps link. If you require a postcode to follow, please do not use the postcode for The Beech Estate. The closest postcode to use is TN33 9QU. This postcode lands you about 100-150 metres from the campsite entrance. There is a sign 100 metres either side of the entrance saying “CAMPSITE 100m”. Turn right into the asphalt driveway that is marked with TWO GREEN POSTS WITH WHITE PAINTED TOPS on either side – one of these posts has a small sign with the image of a TENT attached. Nearest Station: Battle (three miles away). Trains run regularly from London Charing Cross and London Cannon Street take about 1hr 20 mins – making the campsite easily accessible from London. The nearest bus stop is on the edge of the town of Battle on the A271. Bus Route 95. The walking distance from Battle is approximately 3.0 miles (although be careful on country roads). To protect the natural environment, Beech Estate is car free. From the car park follow the signs to reception and the wardens will give you a map showing your pitch location. It’s a short walk into the secret woodland campsite. We provide wheelbarrows to assist with any belongings you may have. 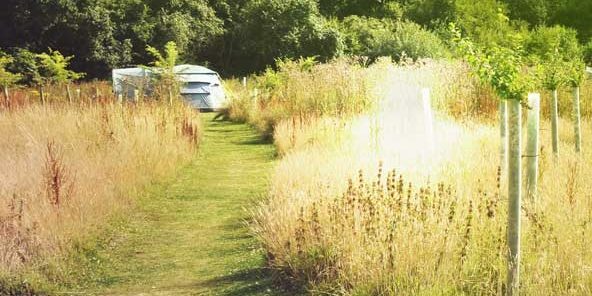 Our wardens live onsite to assist you while you enjoy our version of ‘wild glamping’ and real camping. Your confirmation email will provide exact location details. So if location is important – if you’re looking for camping near to London, Brighton and Hastings – a forest campsite in East Sussex – then look no further and come and camp with us in the woods. If you are trying to locate The Secret Campsite Wild Boar wood please click here.